Dr. Yihong Qiu is currently a Senior Research Fellow, Oral Drug Products, Science and Technology, AbbVie. His in-depth knowledge and extensive experience encompass various phases of product development, including preformulation, drug delivery technology, product/process design, biopharmaceutics/pharmacokinetics, formulation/process development, scale-up and optimization, manufacturing trouble-shooting, intellectual property and regulatory registration for NCE’s, line-extension and marketed products. He also plays a key role in the product life cycle management, IP strategy, scientific and regulatory assessment of business opportunities. During his 25-year tenure with Abbott/AbbVie, his work has resulted in successful commercial IR and MR products, patented drug delivery technologies, IVIVC’s and biowaivers approved by global regulatory agencies. Dr. Qiu’s research interests include modified-release delivery systems, dissolution, bioavailability, IVIVC, drug delivery technology and science-based regulation. He is an elected fellow of the American Association of Pharmaceutical Scientists (AAPS), a member of 2010-2015 USP Expert Committee and a review committee member of Chang Jiang Scholars Program (2014-15). He has more than 50 publications in journals and books, 30 patents granted or pending, and numerous invited presentations. He is routinely invited to lecture at professional organizations and universities. Dr. Qiu received BS in Pharmacy, MS. in Pharmaceutics from China Pharmaceutical University, and Ph.D. in Pharmaceutics from The University of Iowa. Dr. Yisheng Chen currently serves as Vice President of Product Development at Novast Laboratories, Ltd, leading the development of pharmaceutical products for global markets. Dr. Chen earned his Ph.D. degree in Pharmaceutics in 1994 from the University of Iowa. He then joined Burroughs Wellcome as a development scientist, and later Abbott Laboratories with increasing responsibilities where he was elected as an Associate Research Fellow, Volwiler Society. Dr. Chen also served as an expert member of both the Product Quality Research Institute (PQRI) and the USP Performance Testing Expert Panel, and as an adjunct professor at the Guangdong Pharmaceutical University. Dr. Chen has in-depth knowledge and extensive experience in various aspects of developing solid pharmaceutical products, ranging from formulation and process development, CMC documentation for regulatory filing, scale-up, and validation for commercialization. His expertise includes the quality by design (QbD) development of modified release (MR) products using traditional delivery technologies, and development of new delivery systems for MR products. Dr. Chen has extensive experience in the development and scale-up of beads coating process using Wurster coating technology for different types of products from lab to commercial scales. He has successfully led the development and secured the approval of more than 30 products approved in the US, EU, Japan and China, including new drug applications (NDAs) and high barrier branded abbreviated new drug applications (ANDAs). Dr. Chen also has the expertise in packaging protection of drug products. He developed a theoretical model for predicting moisture uptake by packaged products during storage. His theory provided the fundamental basis for the development of ASTM D7709 and the revision of USP general chapter <671> on the standard methods for measuring the water vapor transmission rate (WVTR) of containers, as well as the scientific criteria of using MVTR/unit product to evaluate the performance of containers for product protection. Dr. Chen has published over 30 peer-reviewed articles, book chapters, and patents. 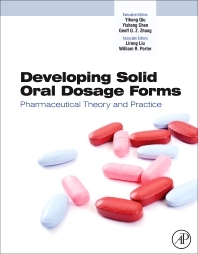 He is a co-editor of “Developing Solid Oral Dosage Forms: Pharmaceutical Theory and Practice”. Dr. Chen is a frequent speaker at national and international conferences, and at major universities. Dr. Geoff G. Z. Zhang is a Senior Research Follow at AbbVie Inc., an adjunct professor of the Department of Industrial and Physical Pharmacy at Purdue University, and a Fellow of the American Association of Pharmaceutical Scientists. He received his B.Sc. in Physical Chemistry from Fudan University, China, and Ph.D. in Pharmaceutics from the University of Minnesota, USA. He has contributed broadly to Physical Pharmacy, specifically in the areas of crystal engineering, polymorphism, characterization and crystallization of amorphous solids and amorphous solid dispersions, as well as delivery of poorly water soluble compounds. He has published over 70 peer-reviewed articles, reviews, and book chapters, given over 170 podium and poster presentations. During his 18-year tenure with Abbott/AbbVie, he has more than 120 granted patents and patent applications. He interacts and collaborates extensively with academic institutes and has mentored 40 graduate students on their thesis and summer research projects. He has received 2012 AAPS Pharmaceutical Research Meritorious Manuscript Award, and serves on the United State Pharmacopeia Physical Analysis Expert Committee.